Jamie Whincup became the first Supercars driver to lap the Surfers Paradise street circuit in the 1:09s bracket to top Friday practice at the Vodafone Gold Coast 600. Whincup, who is bidding to recover a 91-point deficit to championship leader Fabian Coulthard, recorded his 1:09.9179s with two of the 30 minutes remaining. It is marginally below the 1:10.0480s practice benchmark held by David Reynolds since 2013. The session was punctuated by two red flags, the first to realign the Turn 15 tyre bundle, and the second to recover James Moffat’s crashed Garry Rogers Motorsport Holden. Moffat clipped the inside wall at Turn 11, which shot him into the outside tyre wall, causing considerable damage to the right-front corner of the Commodore. Whincup led with 1:10.5868s at the first red flag, with Fabian Coulthard lowering that to 1:10.5337s between the stoppages. 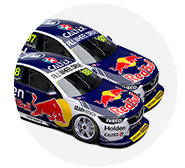 In the final minutes, Whincup, van Gisbergen and Reynolds improved the benchmark further, before the six-time champion fired the final shot. 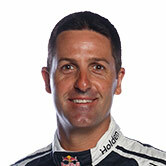 “The car’s good,” Whincup said. “It feels comfortable to drive. “We pushed hard there on good tyres, and extracted the most out of it. I like this place, it’s good to go quick. “It’s quite funny, I did a 11.5s this morning, and [Paul Dumbrell] went out and did a 11.1s [in the co-driver session]. “I thought I might have been out for quali, and they’d put PD in! Thankfully I recovered in P3. “The track was perfect, these new tyres are grippy, compared to last year, plenty of drive out of the hairpins. Chaz Mostert, who topped the first session of the day, jumped 11 spots to second just prior to the chequered flag, falling just 0.1858 seconds shy of Whincup. “I’m pretty pumped, to be honest, to be in the top three at the end of Friday practice,” he said. “I could do what I wanted to do out there, we struggled with some little bits and pieces. “We’ll go through the data and tune it a little bit more. We did our time on lap three, just kept making little kerb errors, I didn’t expect the grip level I had. “It was turning, I was driving, it was doing everything right, but we probably need to tune it a little bit. Reynolds ended up third from Scott McLaughlin, van Gisbergen, Coulthard, Mark Winterbottom, Cameron Waters, Todd Kelly and Craig Lowndes. Lowndes spun at Turn 4 at the start of his final run, ending up stranded on the circuit partway around the blind corner. The TeamVortex Holden suffered a head-on bump from Alex Rullo, but suffered only minor damage and was able to return to pitlane for the end of the session. “I got a good run out of the first chicane, just locked the rears, spun around of my own doing,” he said.